St Mellitus was the first bishop of London and became the third archbishop of Canterbury after Augustine and Laurence. King Sabert of the East Saxons became a Christian. When he died, he left his kingdom between three sons, who refused to be baptized. In 616 they demanded of Mellitus that he give them the bread that would offer them special protection. Mellitus told them that the bread was only special for those that accepted Christianity in baptism. Sadly, the sons were not convinced. Mellitus went briefly into exile, until archbishop Laurence converted king Eadbald of Kent and Mellitus was recalled. The story is told in Bede's Ecclesiastical History of the English People, Book II. Mellitus' feast day is April 24th. For services of baptism, holy communion and commemorations of St Mellitus or bishops. This piece was written in 2007 for the baptism of Robin Ward. 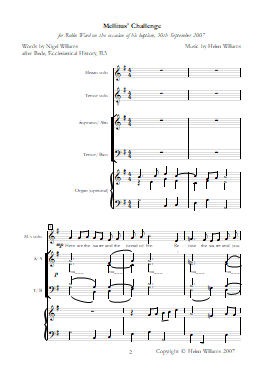 For four-part choir, with solo tenor and mezzo-soprano. Organ accompaniment is optional.